When cans of pumpkin go flying off supermarkey shelfs and people starts freaking out because there won’t be any pumpkin pie this year, I really just have to sit back and laugh. I don’t see pumpkins just for halloween carving fun (I grew up not knowing you could actually eat pumpkins…) Instead, I see delicious meals out of each one of them and the pumpkin I picked up at the farmer’s market was perfect for hummus. 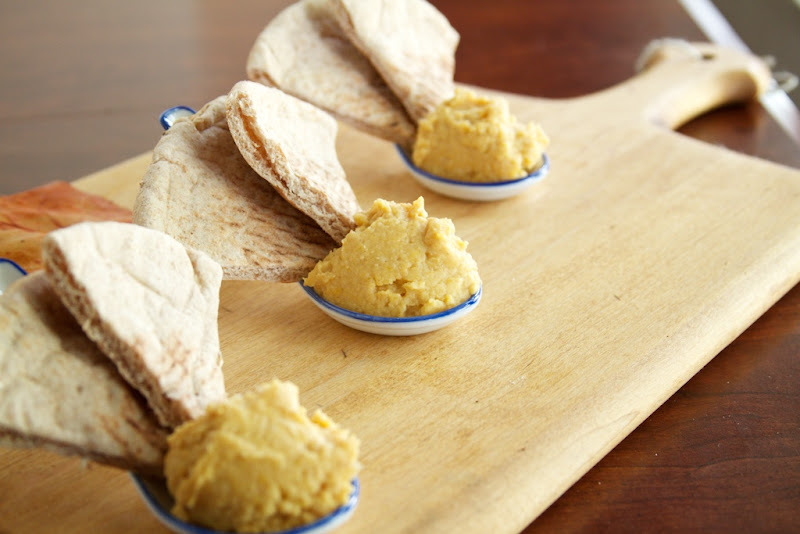 Seasonal pumpkin hummus. I love fall, I really do! Pre-heat oven to 375˚ for pumpkin puree. To make your own pumpkin puree cut a pumpkin in half, remove seeds and strings, brush with olive oil and place rind side up on a baking tray. Let bake for 60-75 minutes until the pumpkin is soft. Remove from the oven and let cool until you are able to handle the pumpkin. 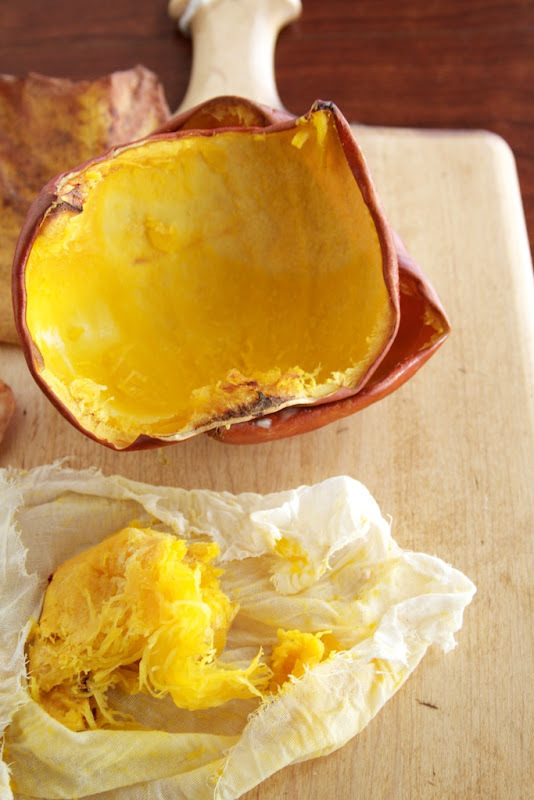 Remove the pumpkin pulp from the rind and place in a large bowl. Mash until all the lumps are removed (you can also use a food processor at this point.) Finally, place pureed pumpkin in cheese cloth and squeeze out as much water as you can (I reserved this for my hummus.) Measure out one cup and place in the food processor. For hummus: add all the ingredients, except the water/pumpkin juice, to the food processor. Run processor on low and slowly add the pumpkin juice in, one tablespoon at a time until hummus becomes creamy. Remove from food processor and serve with pita bread! I recently made my own pumpkin puree for the first time, and completely agree with you that it trumps the canned variety. The color is much more vibrant and the taste is obviously more fresh. 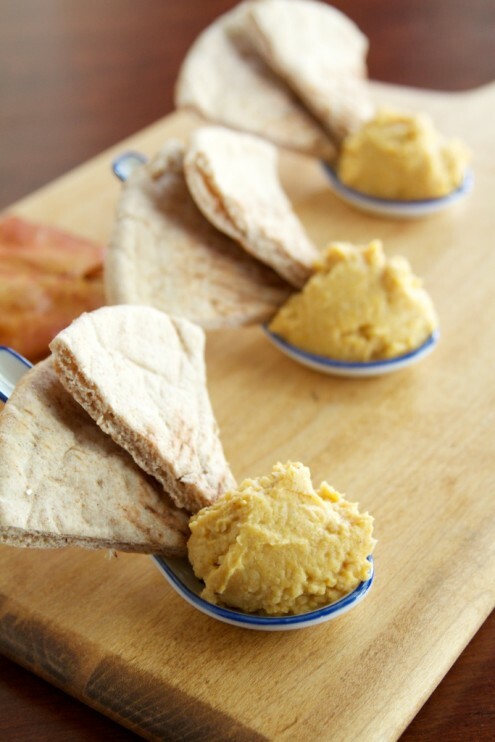 The pumpkin hummus sounds great! I think I love hummus just for the shear fact of how easy it is! I’ve eaten pumpkin hummus once before and it was fabulous. I agree that homemade pumpkin puree is far superior though, like you, I’ll supplement with perfectly fine store-bought when need be. Must try your recipe here! You can really use any pumpkin but I tend to go for smaller pumpkins (stores sometimes sell them as “pie pumpkins”) You want pumpkins that could fit on a baking tray relatively easy! BTW..your pictures make me want to eat everything. I think any dip you might make would work well in spoons (hot and cold)! Mmm…mmm….good. I never thought to do this! I subbed pumpkin pie spice for the cinnamon and nutmeg and added 2 tsp of fresh lime juice to add a little tang. Definitely will be making this again! I just came across your site and I’m very much impressed! I also have just made my first batch of roasted red peper hummus and this is on my list to make next. Looks delicious! Hi Erin. I’m thinking of making this. Quick question. For the puree, do I add just one cup or all the puree that the medium makes? Or is that likely the same? Thanks! 1 cup- it just depends on the pumpkin size if you have any left over. What could I substitute for the sunflower oil?